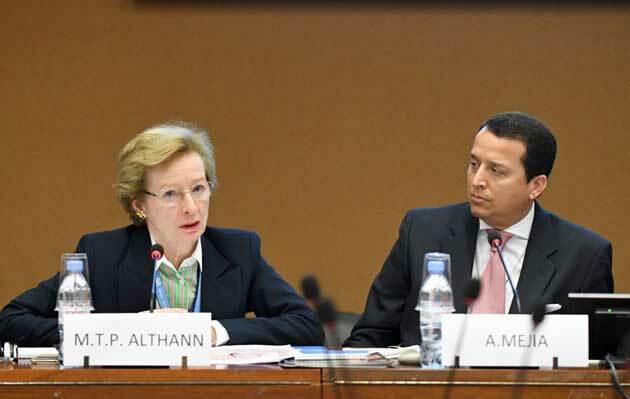 The meeting “Celebration of diversity: beyond tolerance the path towards empathy” was organized on the margins of the 40th regular session of the UN Human Rights Council by the Geneva Centre for Human Rights Advancement and Global Dialogue and the Permanent Mission of the United Arab Emirates to UN Geneva. It was held on the occasion of the 2019 International Day for the Elimination of Racial Discrimination. In a message of support to the co-organizers of the debate, HRH Prince El Hassan bin Talal’s appealed to Christians and Muslims to raise their collective voices in repulsion and condemnation of terrorist and violent extremist attacks like the ones witnessed in Christchurch, New Zealand. “Terrorism has no nationality and religion but is an aberration that can be stimulated by irresponsible political discourse thousands of miles away,” HRH Prince El Hassan said. “The terrorists intended to spread fear and hatred. 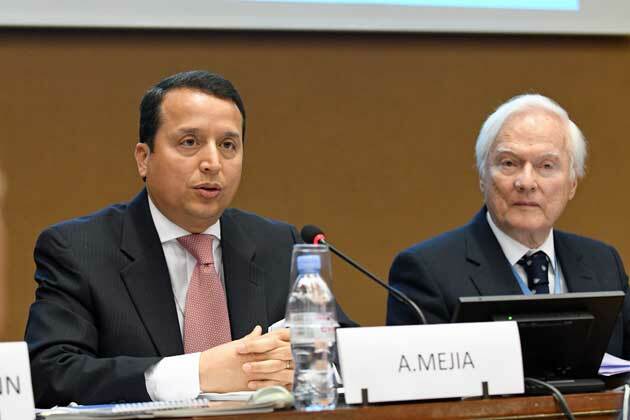 On the contrary, we are here today to send a message of peace, tolerance and human brotherhood,” the Ambassador and Permanent Representative of the United Arab Emirates to UN Geneva, HE Obaid Salem Al Zaabi, added in his statement. 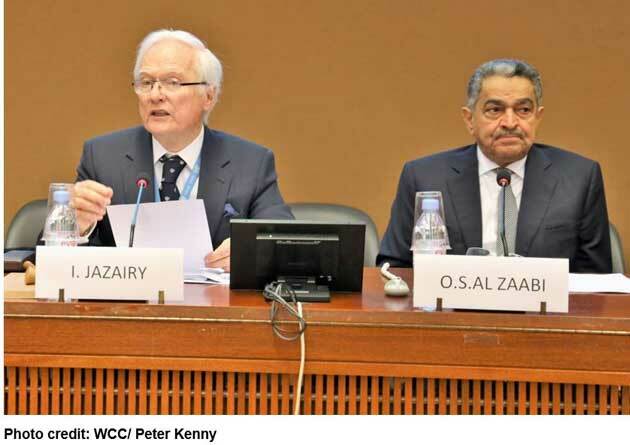 In this connection, the moderator of the debate, the Geneva Centre’s Executive Director Ambassador Idriss Jazairy, observed that the world is “witnessing a rise of exclusionary politics and a vociferous repetition of discourses of division.” “In such a context, diversity is being rejected as an alleged source of weakness,” he added. Ambassador Jazairy reiterated the importance of identifying “inspiring ideals to foster unity in diversity and to be guided by our common humanity.” “Tolerance is not an end in itself, but it is the path that leads to empathy. The latter is the gateway to peace,” he underlined in his opening remarks. 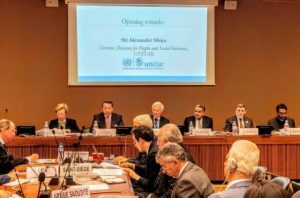 In his opening remarks, Mr Alexander Mejia, Director of the UNITAR Division for People and Social Inclusion, spoke of the importance of dialogue in the framework of the 2030 UN Agenda for Sustainable Development which has to be people-centered and where peace and tolerance have been put in priority. In this regard, faith based organizations need to play a major role and focus on those left behind. Giving examples of Spain and Fiji, he illustrated successful efforts in combatting violent extremism, youth radicalization and building community resilience. Mr Mejia added that it is crucial to garner the support of public opinion in promoting tolerance and acceptance of the Other. The conference focused on the outcome of the historical visit of HH Pope Francis and the Great Imam of Al-Azhar HE Sheikh Ahmad Al-Tayyib to the United Arab Emirates in February 2019. During the visit, the Joint Document entitled “Human Fraternity for World Peace and Living Together” was adopted on 4 February 2019 by these Eminent Dignitaries reiterating the importance of harnessing the collective energy of religions and faiths to uphold equal citizenship rights and in the promotion of tolerant and inclusive societies. Dr Farouk Hamada, Spiritual Advisor to the Court of the Crown Prince of Abu Dhabi, underlined that the future of humanity lies in the promotion of peace and security but that a tiny minority of terrorist spread fear, hatred and destruction. A great responsibility therefore rests with religious and lay leaders as well as educational institutions. In this context, he cited the example of the UAE which represents a contemporary model of cooperation, co-existence and tolerance with 200 nationalities among which the law makes no distinction in terms of rights and justice. A unique development – he said – was the meeting on 4 February 2019 in Abu Dhabi between HH the Pope and the Grand Imam of Al Azhar resulting in the adoption of the Joint Document on Human Fraternity which built upon the foundations of tolerance and convergence laid by the founder of the UAE HH Sheikh Zayed bin Sultan Al Nahyan. 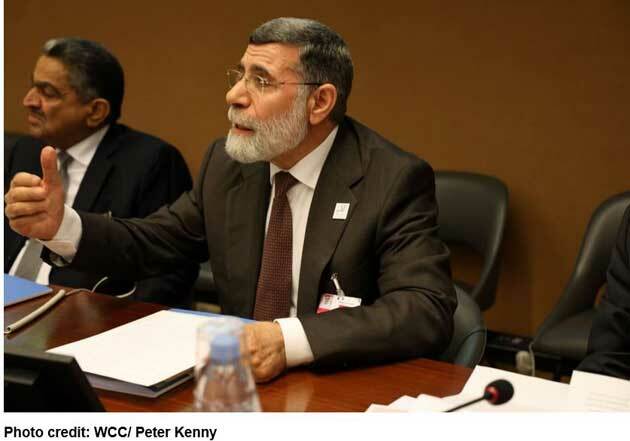 Dr Hamada added that the 25 June World Conference expressed the same principles and vision. The speaker added that the current President of the UAE HH Sheikh Khalifa bin Zayed bin Sultan Al Nahyan followed the same path and proclaimed 2019 as the Year of Tolerance in the country. “It supports the view of citizenship based on equal rights and obligations, demonstrating the need to reject any form of discrimination as well as the term of minority, which brings about sentiments of inferiority and isolation,” she added. 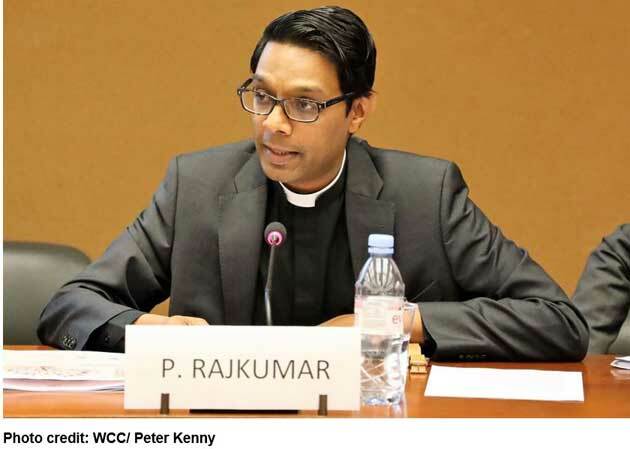 Ambassador Jazairy in turn cited the provisions contained in the Joint Document on Human Fraternity, stating that it “expresses almost identically” the fundamental values and messages contained in the Outcome Declaration of the World Conference on “Moving Towards Greater Spiritual Convergence Worldwide in Support of Equal Citizenship Rights” that was adopted on 25 June 2018 at the World Conference on religions and equal citizenship rights. This conference which was held by the Geneva Centre and its partners in Geneva on 25 June 2018 under the Patronage of HRH Prince El Hassan bin Talal of the Hashemite Kingdom of Jordan and which received strong support by the UN Secretary-General through a video message. “They both contain vibrant calls to celebrate diversity, promote a culture of fraternity and cultivate profound empathy towards the Other,” he said. It was also noted at the panel that a resolution was unanimously adopted by the participants at the XIV International Conference on “A New Concept for Human Security” held on 26 October 2018 in Belgrade by the European Centre for Peace and Development – UN University for Peace, endorsing the World Conference Outcome Declaration. 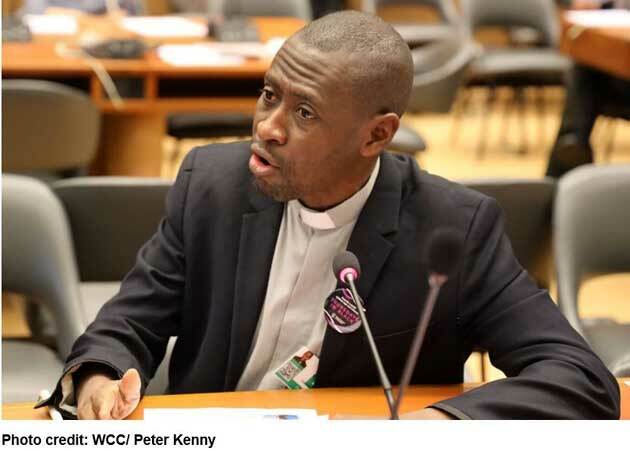 The Geneva Centre has likewise submitted draft resolutions to The League of Arab States, the Organisation of Islamic Cooperation, the African Union and to the Organizing Committee of the 5th World Forum on Intercultural Dialogue requesting the endorsement of the Outcome Declaration. The participants expressed their keen desire to join in supporting this milestone Outcome Declaration. 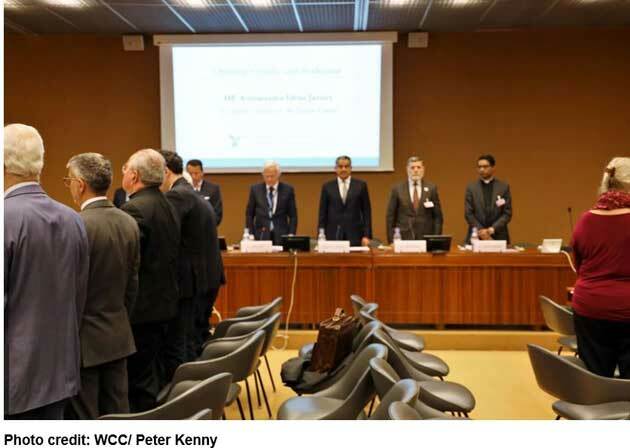 In conclusion, the former Permanent Representative of Yemen to UN Geneva, Dr. Ebrahim al-Adoofi, moved that the meeting address a message of appreciation to the government of New Zealand in the wake of the terrorist attacks of Muslims praying in two mosques in Christchurch on 15 March. 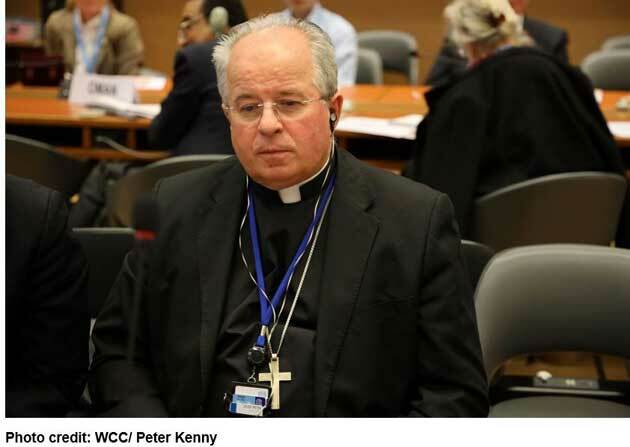 The meeting which adopted this proposal unanimously felt that the handling of the aftermath of this terrible event stood out as a shining example of the potential of convergence between world religions and a recognition that it is empathy and not ethnicity that create and maintain the community. During the meeting, the panellists and the audience observed a minute of silence in solidarity with all innocent victims of violence and hatred worldwide.